Family favorite! Haven’t bought hummus since I made this the first time. Easy and tasty dip that was a nice change of pace from hummus. I only made 2 changes, cut the olive oil back to 1 tablespoon and doubled the lemon juice. Best if made at least a few hours or a day ahead to allow the flavors to meld. This was a hit with my family. A fantastic recipe to elevate grocery store olive bar olives to a company-worthy canapé. Delicious as written! Not great. The color was weird and I suspect I used bad grocery store feta. You need the real thing for this to work. Nobody touched it. As written this was under seasoned and boring. Just keep adding salt, lemon juice, and ras el hanout until it tastes good. I wound up using the juice of 1 1/2 lemons and triple the amount of ras el hanout. Also served with a dollop of harissa on top. Once this was well seasoned it was delicious. Double the spices in the soup and skip the finishing spice oil. You won't be sorry. My lentils took twice as long to cook...probably due to high altitude. I also had some veggies lying around the crisper drawer so I diced up one large carrot, two celery stalks, and one red pepper and added them with the onion. Served with a sprinkle of cilantro. This was just okay for my husband and me. We thought the amount of dressing should be cut in half, if not more. Wish I had started with a third and worked from there. Kale greens were drenched. We liked the combination of the kale and sweet potatoes, though. May give this another try with way less dressing and more roasted pecans. Even my kids loved this! This is excellent - very flavorful and easy. Really good, but a tad bit too garlicky for me. I am not a huge fan of raw garlic and would cut the amount in half next time. Otherwise, made as written except I cut the olive oil in half for roasting the cauliflower and for the chermoula. Loved the sweet bite of raisins in this salad. This was really delicious and, uncharacteristically for cauliflower, pretty too. Loved the bits of raw carrot for color and crunch, and golden raisins helped keep the salad bright. I didn't see the point of having the cauliflower covered for part of its time in the oven, so i skipped that step, and it came out just fine. A little trouble to make the sauce, but worth it. Great flavor! I'm not a fan of any kind of white rice, so I subbed in short grain brown rice....and wished I'd looked at other risotto recipes using that before diving in, as it took 75-80min for it to cook properly. Next time I'd definitely parboil it first (maybe in seafood stock), and then decrease the amount of water added to the broth. I decreased the oil in the salsa verde to 2 T, and to the broth, I added some dried orange peel, one dried red chile, and a chunk of parmesan rind. I wish I'd strained the clam-infused hot wine before adding anything else, as I think there were some tiny pieces of clam shell in there (there was some grit from somewhere, even though I soaked and scrubbed the clams ahead of time). I used hot chicken stock when I ran out of broth at the end. Razorback clams were what I could find, and they were good, but would've used littleneck if they'd been available. I found this to be quite good and I liked the combination of flavours. I thought the dressing lacked something so next time I would add a bit of lemon juice to sharpen it up. Weird, overwhelming combination of flavors, and unpleasant textures. Really nice pasta primavera salad at the end of a hot day. I added spinach and wilted it at end to add more iron/ protein. Easy to make. Okay but nothing spectacular. I always find couscous pretty boring and hoped adding the dates and pistachios (along with EVOO and broth) would jazz it up and give it more moisture. The result wasn’t much more flavorful or moist. It was improved with the accompaniment of the pistachio sauce for the chicken thigh recipe in the same cookbook. Really good flavors, but having the carrots and celery cook so long leaves them softer than I would like. Made a nice meal served warm with couscous and green beans. I like that they are quick to put together, but they were pretty dry and could use more salt (unlike most things in this book). Easy enough to fix, I suppose, just use fewer breadcrumbs. Really delicious and satisfying. I made it with kale. Very nice, bright tasting alternative to lemon-parsley gremolata. The kids asked for seconds! Delicious treatment of this vegetable. Using this method of roasting, the green beans had great texture and the dressing added bright, fresh flavour to the dish. Brining the mushrooms did result in even seasoning but it was the roasted garlic dressing that provided most of the flavour. Delicious! Goodness this was good! One of the best zucchini recipes I've made in recent memory. Made a half recipe and used a can of stewed tomatoes. It's easy to prepare but a bit time consuming since you need 30 minutes to simmer the tomato sauce and 30-40 minutes in the oven. Great side dish for a cold winter supper. So, so good! A restaurant worthy meal that would impress friends and family...and is easy to boot. We substituted cod for the hake, but otherwise made as written. Used a Pinot Grigio from California for the dry white wine. Will definitely make this again and again. Excellent! Light and flavorful. The combination of carrot ribbons, white wine, coriander, olive oil, and lemon juice really enhance the fish. I followed the directions exactly and it turned out perfectly. Finding haddock on sale at my local Whole Foods, I used it instead and decreased the braising time since it was a thinner piece of filet than halibut. My husband and I really liked the flavors. Easy to prep and make. Good! I didn’t realize that this is a popular dish in Italy nor did I realize how often it appears in my cookbooks. I wouldn’t think to pair shrimp with white beans, but can now see why it’s popular. For me, it was a fairly bland but hearty dish that was satisfying and healthy. Nothing spectacular but nice! I used baby romaine and green bell peppers since I already those in my fridge. A nice go- to, if you have salad greens, bell pepper, shrimp, and canned cannellini beans on hand. Just ok. Could be an authentic flavor I don't care for, but I felt like the lemon flavor was too pronounced. I didn't exactly follow the recipe so take this review with a grain of salt. I used all the ingredients called for just in different quantities based on what I had. These are the changes that I made: reduced olive oil to 1 T, used 1 onion, 1 pound squid, 2 cans of tomatoes and kept everything else the same. What I made was delicious but it turned out to be more of a tomato stew with some squid rather than a squid stew with some tomato. Served over rice with parsley and celery leaves for garnish. The squid took closer to an hour to become tender. I think this would be equally good with shrimp or a firm white fish. Very tasty version of cacciatore that delivers on the promise of moist chicken and robust sauce. Lovely taste treat with the pistachio sauce. I should have completely wiped out oil from baking sheet after baking step. And should’ve put the oven rack on second level when I broiled the top side. The accumulated olive oil caught on fire. Luckily, I was paying close attention. Next time I’ll also use less EVOO (really didn’t measure in exact increments). Served with couscous and chopped dates from same cookbook. I was really pleased with this recipe since it uses a reduced amount of olive oil compared to most recipes. I further reduced it to 4 tablespoons by only using the quarter cup to saute the vegetables. There was adequate leftover oil in my nonstick skillet to make the tortilla. I would have loved to use the roasted red peppers for additional flavor, but I had a dinner guest that hates peppers. I used a v-slicer for the potatoes with a 3 mm slicing blade to get nice even-sized potatoes. Will definitely make this again. This came out fantastically well--as good as or better than any Spanish tortilla I've had in a restaurant. The only change I made was to add about a third a cup of thinly sliced greens. If you cook it in the recommended 10-inch skillet but forget to cover it, as I did, it will take about eleven minutes (instead of two) to set enough to flip. (I'm sticking with this mistake next time, since I was happy with the results.) It was really easy, and uses only 6 Tbs. of oil for at least six satisfying servings, whereas many tortilla recipes call for at least a cup. I will definitely return to this one. America's most trusted test kitchen tackles a topic with serious staying power: the Mediterranean diet. 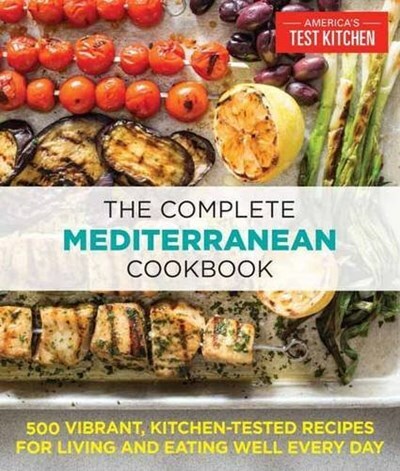 This thorough yet user-friendly book brings the Mediterranean into the American home kitchen, with 600 amazingly flavorful yet surprisingly approachable recipes for everyday cooking.